to the approval of Assam State Legal Services Authority. a) Bachelors Degree from a recognized University. b) Computer knowledge of MS Excel and MS Workd. Experience in handling accounts work in Govt. Semi Govt/ PSU department/ institutions. Working knowledge preparation of pay bills/ OE bills in a Govt. Department. Working knowledge of TDS, VAT and Income Tax etc. and other related matters. Age: 18 to 38 years as on 01.01.2016, in appropriate cases, relaxation of age will be admissible as per existing rules. 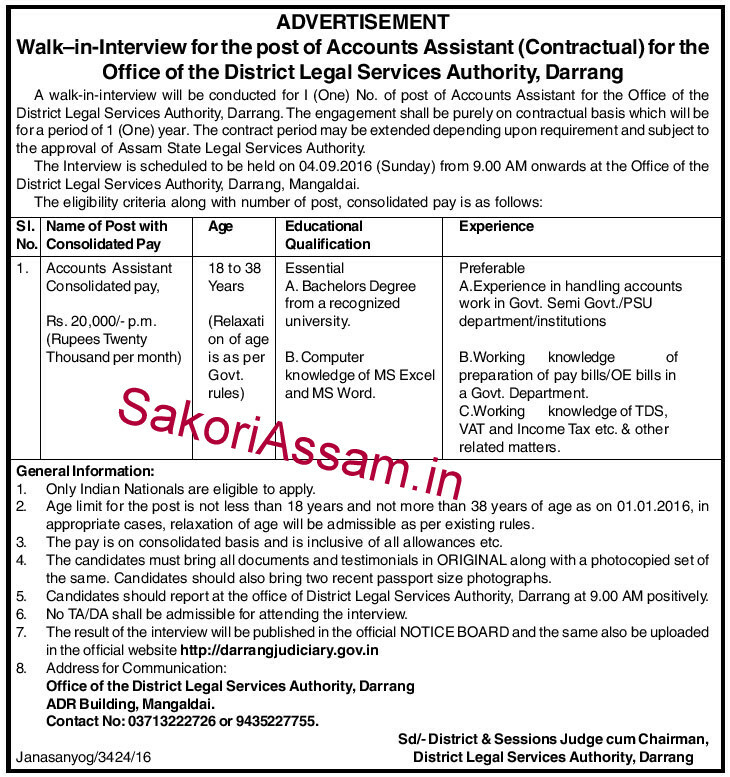 Date and Time: The interview is scheduled to be held on 04.09.2016 (Sunday) from 9.00 AM onwards at the Office of the District Legal Services Authority, Darrang, Mangaldai. The candidates must bring all documents and testimonials in original along with a photocopied set of the same. Candidates should also bring two recent passport size photographs. Contact No. 03713222726 or 9435227755.